Welcome to part 2 of our Sale-A-Bration Farewell 2016 Global Blog Hop! You will be hopping around 8 countries and will visit 15 amazing Stampin’ Up!® Independent Demonstrators who have joined this adventure to give you a closer look at the beautiful items from Sale- A Bration 2016. There’s just 6 days of Sale-A-Bration left and then the opportunity to get these freebies will be gone forever! Currently you’re visiting Bibi Cameron in the UK! You can continue hopping by using the list of names at the end of this post. 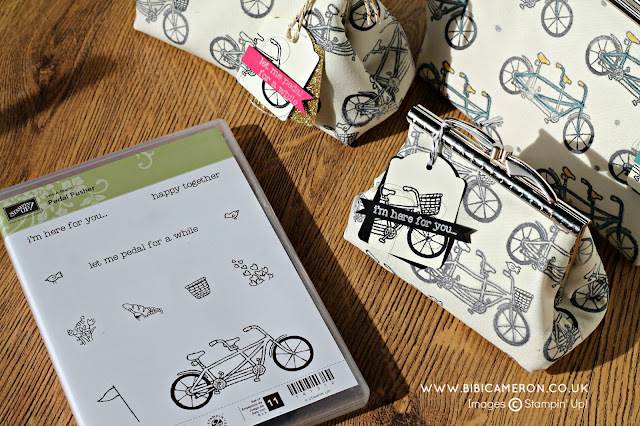 Now, let’s scroll down to see what I’ve been making with Pedal Pusher stamp set. 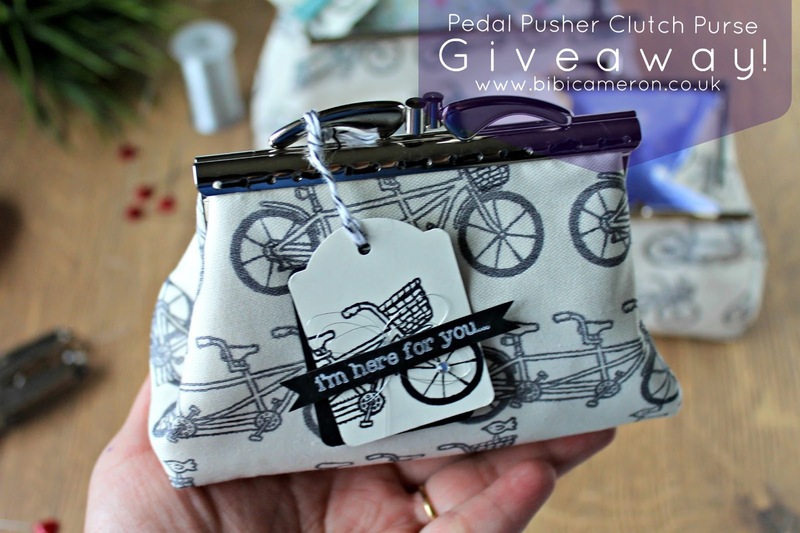 I love stamping on fabric and making bags and purses is my favorite thing so when I saw the bike in Pedal Pusher Stamp set I went ahead and I stamp the beautiful image on fabric to make clutch purses with metal frames! I also made a wee tag to finish what could be a sweet handmade gift and I'm looking forward to make paper craft projects with this set this weekend! so come back this week to see what I will be making. 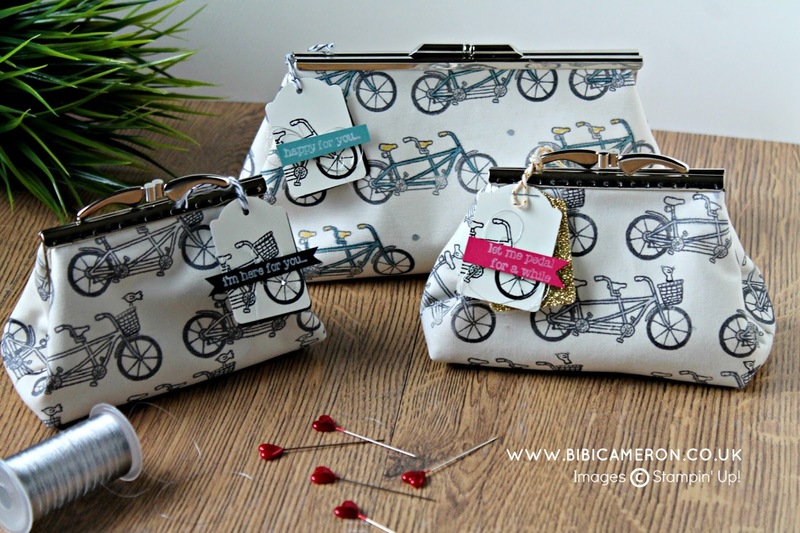 I also would like to thank you for visiting my blog today and I have decided to GIVE AWAY THESE 3 PURSES (find info at the bottom of this post for the chance to win). I took the same or perhaps less time making 1 purse than designing a card lol. Seriously this is an easy project when knowing the right thing. Stamping the fabric is pretty much the same that stamping on any other surface. You need to make sure you use the right ink to avoid bleeding or fading and getting a nice, smooth, absorbent fabric. Sewing the purses could seem a bit complex but you will be surprise how easy could be making them with easy to digest information and they can be sewn by hand too! so there is no need for a sewing machine if you haven't gotten one. The next stop on the farewell hop is Valerie Lo. There’s lots of inspiration to be found in this group and you don’t want to miss it! Do you want to learn to make this project? 1 of these 3 purses can be yours! For your chance, leave a comment below by 12:00 CET/ 11:00 am UK time on 4/20/16 telling me which is your favorite (the smaller, medium or large) and what do you think about this project. The winners names will be randomly selected, emailed and posted here in my blog next day ( Saturday, April 21/2016 8:00 p.m UK time). I'll ship to international winners too! And to make Sale-A-Bration even sweeter all my customers will also receive one small FREE clutch purse when placing an order. Love love love these clutch purses. It´s a great idea to stamp on fabric ! Wow ♥ such great projects. Love the idea of stamping on fabric. 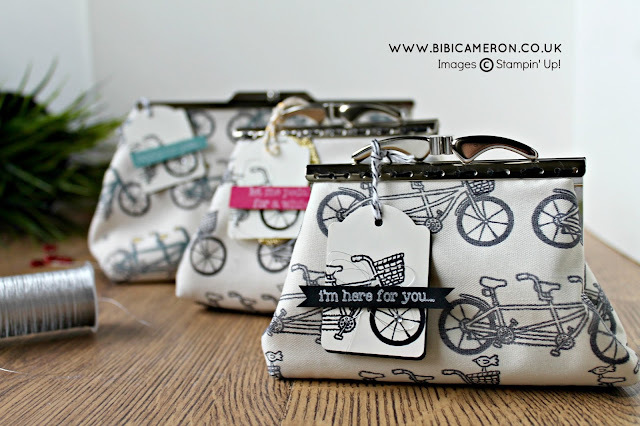 Bibi - these purses are absolutely amazing. What an incredible talent you are! That's a lot of stamping and a lot of sewing. The purses are so trendy and cool. I'm so happy to be hopping with you today. I absolutely love the way you used this stamped image on fabric. All the purses are cute but if I had to make a choice I think my favorite is the medium-sized one. Unfortunately my sewing skills are limited so I am in awe of your talent. Oh my gosh Bibi - I am in awe of your fabric projects, you are so very talented! I love the pop of pink on the tag of the medium sized purse so this is my favourite at a push, but I love the subtle colouring on the larger one too. Fabulous projects! I've never stamped on fabric so I was in awe of your purses. I might have to try stamping on fabric now. Great idea and I love the purses! The medium size one is my favorite! Bibi - this is absolutely amazing. I'm checking out the tutorial now! Such darling little clutches! Love them all but I think the medium size is my favorite! These purses just blow my mind-Wowza!! Love them. Thank you for sharing your wonderful projects. These purses are amazing! I like them all but especially the little one. You did a fantastic job...thank you for the chance to win one of these. Have a great weekend. Bibi, these are absolutely precious!! I stamped on material once and made a baby bib. I just used regular SU ink tho and I was afraid it'd bleed, so I kept it in my craft storage. What type of ink did you use? Love the inside fabric! You're one talented lady! Og my goodness these are just the cutest thing I have seen done with a stamp set this year!! Been awhile since I have used my sewing machine ... might just have to dust it off after your inspiration. Thank you for sharing your amazing talent. 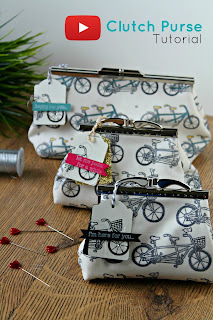 Very clever idea to stamp on fabric to make these adorable clutches. It's hard to pick a favorite, but since I have to it would be the smallest. I love all three and what a inspiration you are. I've never thought to stamp on fabric, but now I'll have to. The clutches are absolutely gorgeous; what a beautiful way to use that great stamp image! Love them all, but the large one, with the blue bikes and lovely lining, is particularly pretty. Wow...such talent. I love them all. I love the medium. One of my favorite things to do is sew! Your clutches are so beautiful! My favorite one is the smallest clutch. Thanks for sharing your awesome ideas! I would love to see the tutorial for this. Absolutely the most cleaver use of the "Pedal Pusher" stamp set yet! I like the large one. So very cute and clever! That is amazing! Who would of have thought stamping on fabric and then creating a clutch! Kudos to you! A job well done! Bibi, these purses are fabulous!!! These are absolutely adorable. I love them all, but if I had to pick, I think the small one is my favorite followed closely by the large one. What a clever idea. They would make a fabulous gift for a special friend. I admire your many talents. Great job! These are so adorable. You are amazing. I love the little one the most, then the medium and then the large. They are all great. fabulous idea! love them all! This is so cute! My friend is getting married in June and their theme is bikes because that's what they did on their first date. I think it would be so cute if I got her the medium clutch as her wedding clutch! absolutely adorable! Love the colors of inks you chose on them. Did you color with fabric markers? Thanks! Going to watch your video now. Thanks for sharing and for this fun opportunity to win something! I love them all, so unique and very talented, I prefer either the large or medium!! I love them, so talented and cute, I prefer the large or medium, so cute!! Oh, you are so talented! These purses are all just adorable🤓❣. Thanks for the chance to win a treasure. The smallest would be perfect. These are gorgeous!! What talent you have - amazing!!! Love them all - especially the colors on the larger one. WOW! They're an amazing project, Bibi. What ink do you use for fabric? The tiny one is my favourite. Bibi these are simply stunning. I love them all but I especially love the large one with the touch of colouring on it. 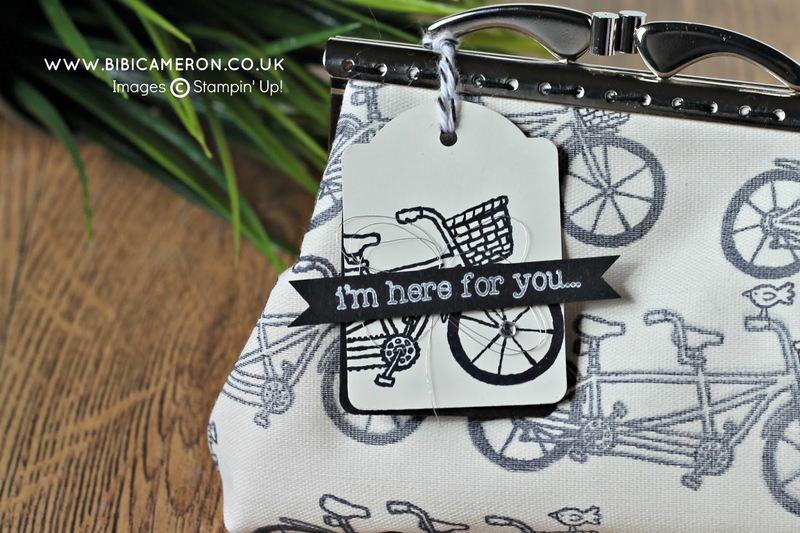 I love your project and any way that shows stamping on different mediums is a winner with me. I love fabric, stamping and sewing but have been so focused on card making of late that I have neglected the fabric side. You've spurred me on to stamp on some fabric and make it into something. I love the matching gif tags too. 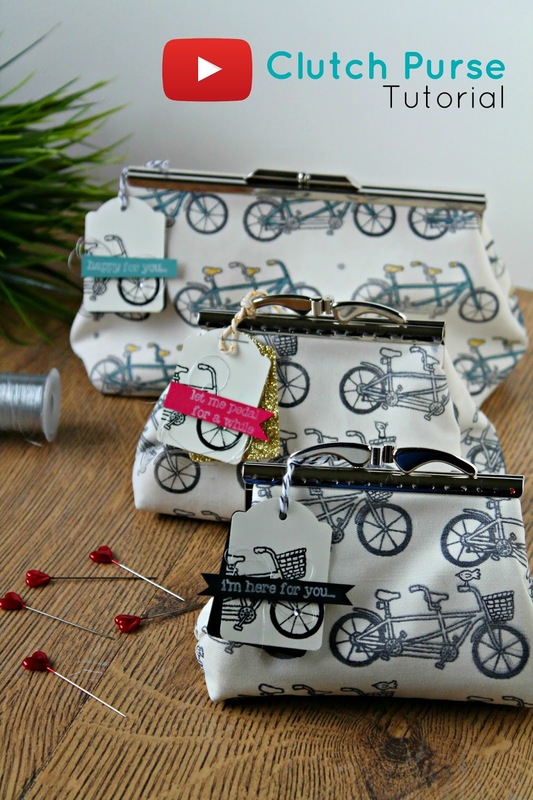 Have not ordered this stamp set, but these purses are fabulous! I like the medium one best. Those purses are amazing!!! The little one is my favorite, although I love them all. What a fabulous idea! They are adorable! Would love to see the little one in person. Absolutely to die for! These could be in a boutique. I like the small clutch the best. So cute and a perfect size for just a few items. You are so talented, thank you for sharing and for the chance to win! Bibi, these are lovely! They look like something you'd find in a boutique on vacation and they're adorable!! I think you have wonderful talent and I'm thankful for the inspiration. I like them all but the larger one is my favorite with the slight coloring and beautiful floral lining. To die for! I like the small one best, just the perfect size for a few items. Thanks for sharing your talent and for the chance to win! You are TOO clever for words. I want to make one. Amazing. These purses are just too stinking cute!!! They are perfect in every way! The little small one is just to munch! But, the large one you colored the bike is Awesome!!! Wow, what a amazing project. Love them all, but have a little crush for the small one. Have a great Easter weekend! OMG- these purses are to die for. I have a friend who would absolutely love these. She is a biker and I would love to win these to give to her for her birthday in May. What a great idea! I love the all of the purses and would love to receive the large one if I am selected. You're a genius! Wow! Amazing job!!! Those purses are gorgeous!!! Someone mentioned you have a new born...well, your creative juices are flowing! Enjoy baby and you have incredible talent...impressive!!! This is such a wonderful idea I would love the large clutch! It would go great with a dress I just bought. Wow, this is just the cutest and most clever idea! I would never have tried stamping on fabric. But now I need to get this set and give it a try! All three are fabulous, the smallest is my favorite! I love all 3 purses! I suppose I like the large best because I could use it to carry out in the open. I would not want to hide this cuteness inside of another purse! 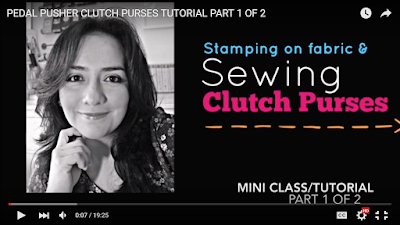 I have ordered the tutorial and am hoping to make these purses for myself! Darling idea. Thank you so much for sharing. I love it!!! Your little clutches are so cute! I didn't order that SAB set, but I'm sure many stamp images would work. Before I decided to order, I found a So California supplier near me for the hardware. Yay! 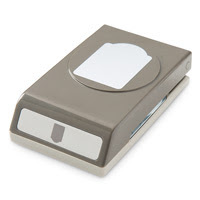 https://www.pursesupplydepot.com/contact.aspx. Gonna go order the tutorial right now! Thanks . . .
Wow! Love them all, beautiful Bibi. Love these little purses. As a long time lover of fabric crafts who is just now getting into stamping I am excited by this new technique to try. For me, if I was really lucky it would have to be the middle size. Thanks for your generosity, I'm off to watch the tutorial. Hi Bibi, i really adore your beautiful purses. Its so difficult to chose a favourite as all three look great, but i will have to choose the medium size. I think these purses are gorgeous! You are very clever. I have this set but have not used it as its not something I would usually use. Having seen what you've done has inspired me to now use it! Was scrolling through Facebook, saw these and my heart leaped a little! Super cute and so quirky and original. A beautiful item. I love the medium one! Beautiful!!! Hi these little purses are so cute. Love the small and medium size. What a great idea on how to use SU stamps for something other than cards. So glad I found this post on Facebook. Bibi - Your clutch purses are adorable!! I like the smallest of the three and can't wait to see your tutorial. I love the little one! Nice that you are using something other than paper - good idea! Thanks for chance to win!! I think this is my favourite project of yours to date Bibi. So unique and simply stunning. I love them all, but if I had to pick a favourite, I would say the medium one as I love the contrast of the Melon Mambo and gold accents against the print on the clutch - uber chic and stylish. 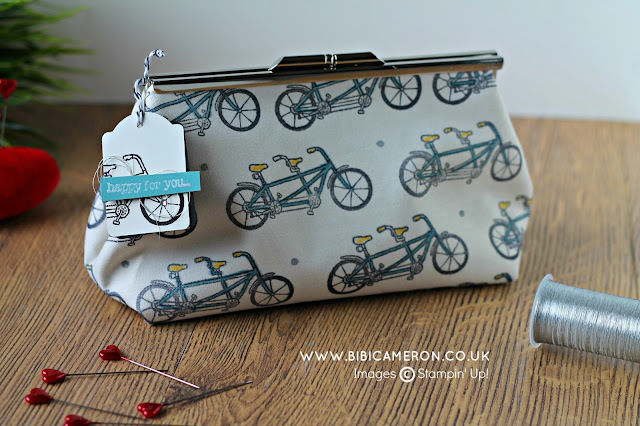 Hi bibs just love these clutches! If I was lucky enough to win one I would like the large one please.